As an average driver, you will likely file a few car damage claims in your lifetime. According to estimates from the insurance industry, most people who get their license at age 16 experience at least one car accident before the age of 34. If you have endured a wreck, you already know that the aftermath is often frustrating and confusing. 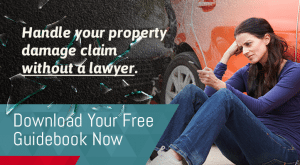 Haven’t dealt with property damage yet? You should consider yourself fortunate, but prepare for the inevitable. At Ward Black Law, we believe it is vital for drivers to understand their rights under North Carolina law and the rules and regulations of the North Carolina Department of Insurance. That’s why we’ve compiled a free, easy-to-read Property Damage Guidebook. With this resource, you will have lots of information to help you handle getting your car repaired or replaced without a lawyer. Read on to learn more, and download our guidebook for step-by-step navigation. Not injured? After calling the police, take a few notes and photos for your personal records. Injured? Seek prompt medical attention and be sure to document all treatment. You may also want to contact a personal injury attorney for assistance and protection. It is important to remember that not all injuries result in immediate pain. Seeing a doctor to rule out future complications is always advised. At the scene, the police should give you an exchange slip with the other driver’s insurance information. Contact your car insurance company, and the other driver’s car insurance company by phone, and follow-up with a written notice of your claim as quickly as possible. After the damage is professionally assessed, your car will be classified as “repairable” or “total loss.” If the car is deemed a total loss – meaning repair costs would exceed 75% of the pre-accident value – you and the adjuster will need to reach an agreement on Fair Market Value. More information on this process can be found in our Property Damage Guidebook. Likewise, if your car is repairable, you can use the Guidebook to learn more about repair estimates, diminished value and your right to a rental car. It is wise to understand your rights before a car accident even occurs. Our Property Damage Guidebook is absolutely free, and has valuable information for navigating this often complex process. Download the guidebook now, especially if you have recently been involved in an accident. However, if you have been injured, you should contact Ward Black Law for a free and confidential case review. Our attorneys in Greensboro, N.C., have years of experience in this practice area. Call 336-333-2244 or toll-free at 1-877-256-1214.